Brooklyn and Jennifer Mayhle clearly know their way around art supplies. Their father’s name freshly engraved Tuesday afternoon on Panel 12-West of the National Law Enforcement Officers Memorial, the two young girls in ponytails confidently approached the marble wall and began their handiwork: precisely etching their daddy’s name, “Stephen J. Mayhle,” on special sheets of rubbing paper, all under the watchful eye of their mother, Shandra. Officer Stephen Mayhle was one of three Pittsburgh Police officers gunned down on April 4, 2009, as they responded to a domestic violence call in the Stanton Heights section of the city. Also killed that Saturday morning were Officers Eric Kelly and Paul Sciullo II, fellow members of Pittsburgh's 5th District. It marked the deadliest single day in the 153-year history of the Pittsburgh Bureau of Police. On Tuesday, Deputy Police Chief Paul Donaldson, a silver-haired, 34-year veteran of the department, led a contingent of family members, other loved ones and police officials on the five-hour trip to downtown Washington, DC, to witness the three officers’ names engraved on the Memorial. It was all part of the Engraving Day ceremony, an event held each spring to symbolically commemorate the service and sacrifice of all of the men and women who have given their lives for the safety and protection of others. As engravers Kirk Bockman and Jim Lee meticulously worked on Panels 12-West and 14-West—a process that took about 20 minutes—family members and other onlookers watched intently, almost mesmerized by the obvious skill and precision of the two craftsmen. They know the process well: Bockman and Lee have engraved all 18,983 names on the Memorial. Once the sand-blasted stencils were removed and the newly engraved names revealed, Memorial Fund Chairman and CEO Craig Floyd invited each of the three families—the Mayhles, the Kellys and the Sciullos—to come forward and have the honor of doing the first etching of their loved ones’ names. Next, Deputy Chief Donaldson stepped forward to do etchings of each of the three officers’ names as well. After each one, he stood and led a silent, final salute to a fallen brother, members of the Pittsburgh Police Command Staff standing directly behind and following his lead. After the formal ceremony was completed, Memorial Fund staff brought gifts for the two Mayhle girls, as well as Eric Kelly’s young granddaughter. Reveling in their new pink-purple hats and charm necklaces, the three girls began hugging and dancing and running to the Memorial’s reflecting pool to dip their fingers in the chilly waters. A poignant reminder that, even amidst the incredible pain and sorrow felt over the loss of three more law enforcement heroes, what these officers stood for and worked toward—a safer world for the next generation—is still very much alive. To view a press release for today's ceremony, please visit, http://www.nleomf.org/newsroom/news-releases/engraving-day-2010-day-of.html. Few people were probably surprised when John Pawlowski decided to join the Philadelphia Police Department. After all, he came from a large family of Philadelphia cops. His father, John Sr., is a retired Philadelphia Police lieutenant and now works for the Pennsylvania Attorney General’s Office. Brother Bobby is an officer. Uncle Ken Linneman, a lieutenant. Aunt Mary Linneman, an officer who was in the Academy at about the same time as John Jr. Uncle Fran Ansel, a retired homicide detective. On Thursday, many of those family members traveled to Washington, DC, to join John Jr.’s wife, Kim; their 10-month-old son, John III; Police Commissioner Charles Ramsey, and dozens of Philadelphia Police officers to witness the engraving of the name John Pawlowski on the National Law Enforcement Officers Memorial. Fourteen months earlier, on the night of February 13, 2009, Officer Pawlowski and his partner responded to the report of an argument between a taxi driver and an unruly man in the Olney section of the city. The officers soon located a suspect, but instead of complying with the officers’ orders to show his hands, the gunman opened fire, striking John Pawlowski twice. A member of the 35th District, John had been a Philadelphia cop for nearly six years. At the time of his death, Kim was five months pregnant. Under crisp blue DC skies on Thursday, Kim; her parents, Ed and Sharon Lee; her sister, Colleen, and other family members were front and center as engravers Kirk Bockman and Jim Lee artfully inscribed Panel 41-West, Line 27. When the two craftsmen removed the sand-blasted stencil and carefully revealed the names, Memorial Fund Chairman and CEO Craig Floyd invited Kim to come forward and do the first rubbing of the freshly engraved name of her husband. She was followed by a steady stream of family members and police personnel, including Commissioner Ramsey; John McNesby, president of the Philadelphia Fraternal Order of Police Lodge #5; and Captain John McCloskey, John Pawlowski’s commanding officer in the 35th. Toward the end of the ceremony, young John III, with the guiding hand of his mother and other relatives, wobbled forward to the Memorial’s wall, to touch the name of the father—the law enforcement hero—he would never know in person. Visit the Philadelphia Police Department's online Memorial to fallen officers. Earlier today, Pennsylvania State Trooper Joshua D. Miller's name was added to the walls of the the National Law Enforcement Officers Memorial. Beginning this week, the names of Trooper Miller, along with 323 other law enforcement officers, are being engraved on the Memorial's marble walls. When the engraving process is completed, some 18,983 fallen heroes will be honored on the nation's monument to law enforcement service and sacrifice. On June 7, 2009, Trooper Miller engaged in a 40-mile vehicle pursuit attempting to rescue a 9-year-old boy who had been kidnapped by an armed offender. When the chase ended, the suspect shot both Trooper Miller and his partner, Trooper Robert Lombardo. Trooper Lombardo sustained serious injuries but has recovered from the incident. The little boy was saved. Trooper Miller was transported to a local hospital where he died from his injuries. A veteran of the U.S. Marine Corps, Trooper Miller first joined the Pennsylvania State Police in April 2003. He is survived by his wife and three daughters. Trooper Miller's death touched the law enforcement community inside and outside Pennsylvania. In July 2007, Trooper Miller was part of a law enforcement team that captured two of the men responsible for the murder of New York City Policer Detective Russel Timoshenko. Last year, the Fraternal Order of Police, Police Detective Russel Timoshenko Memorial Lodge #714 in Staten Island donated $1,000 to memorialize Trooper Miller in the National Law Enforcement Museum's "Thin Blue Line." More information about Trooper Miller can be found at http://www.trooperjoshuamiller.org/. 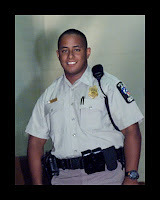 The first Hispanic police officer in the Montgomery County (MD) Police Department to die in the line of duty and the 16th in the department’s history, Officer Hector Ismael Ayala, ended his watch on Sunday, April 4, 2010. He succumbed to injuries sustained in a single vehicle crash of his cruiser that impacted a tree while he was responding to a call for officer assistance for a fight in progress at a local restaurant/bar. Throughout his seven-year tenure on the department, Officer Ayala worked the midnight shift. In his jurisdiction, he was valued in the Hispanic community. Fluent in Spanish, Officer Ayala frequently served as a translator for the department and provided assistance to Hispanic community members. “The department has lost a true asset. Officer Ayala was always helpful to his fellow officers and devoted to serving the Hispanic community. He will be deeply missed,” District Commander Nancy Demme said. Officer Ayala was a strong advocate for traffic safety and blazoned a trail for enforcing traffic laws in Montgomery County. One year alone, he issued 800 traffic citations, and he would take time to politely explain to the driver the nature of the violation. In 2005, he was instrumental in helping to save a man’s life who was attempting to commit suicide by jumping from the roof of the Glenmont Metro Station. Officer Ayala, along with two of his colleagues, was able to prevent the man from actually jumping by physically subduing him. He spent his entire career working in the 4th District of the county and served as a Field Training Officer to new officer graduates. Throughout his career, he was nominated for several awards and commended for his exemplary work in the law enforcement sector. Officer Ayala was well liked and respected by his colleagues. It was not unusual for him to offer to babysit the children of his colleagues when they had a circumstance arise and a need for his help. He also taught many of his recruits how to box since he was known to be a boxing enthusiast. Married with a 14-month old son and triplets due in June, Officer Ayala is survived by his wife, Melissa, and his parents, Hector and Luz, a 20-year-old brother, Geovani, and a 12-year old sister, Jenny Marie. 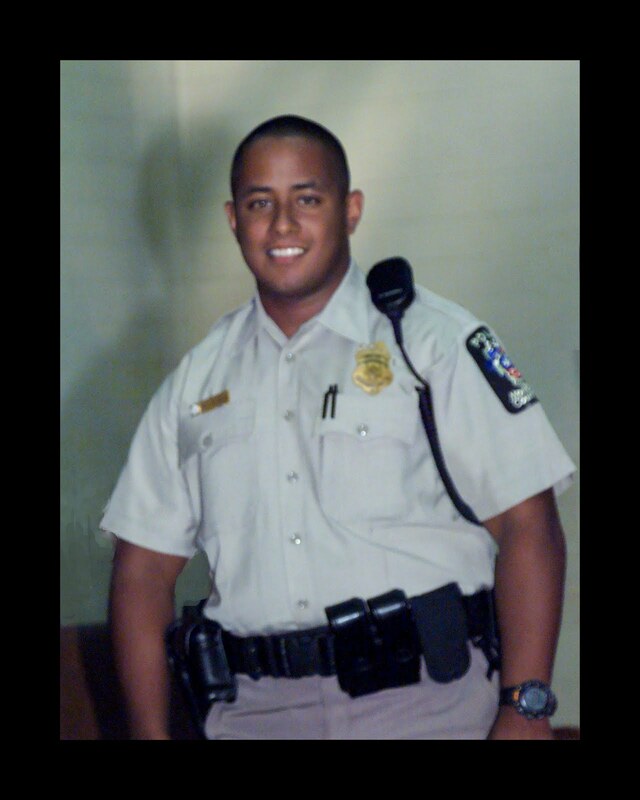 “Officer Ayala gave his life doing what he loved--being a police officer serving the people of Montgomery County. A select few raise their right hand and take the oath of service, an oath that puts their life second to those they protect. Officer Ayala took his oath and served proudly since his first day at the academy,” said Montgomery County Police Chief Thomas Manger. The Washington Metropolitan region and the broader public safety community mourn the loss of Officer Ayala. Though his tour of duty ended too soon in life at too young an age, he made his mark in the profession. His proven record will serve as an inspiration to others in the field to be the best they can be, and his memory will never fade. Karen L. Bune is employed as a Victim Specialist in the domestic violence unit of the State’s Attorney’s Office for Prince George’s County (MD). She serves as an adjunct professor in the Department of Criminal Justice at George Mason University in Fairfax (VA) and Marymount University in Arlington (VA), where she teaches victimology. Ms. Bune is a consultant for the Training and Technical Assistance Center for the Office for Victims of Crime and the Office of Juvenile Justice and Delinquency Prevention, U. S. Department of Justice. She is a nationally recognized speaker and trainer on victim issues. Ms. Bune is Board Certified in Traumatic Stress and Domestic Violence, and she is a Fellow of The Academy of Experts in Traumatic Stress and the National Center for Crisis Management. Tiffany Galer of Martinez, CA! Tiffany's picture, which honors Officer Larry E. Lasater (EOW 4/24/2005), received the most votes in the Memorial Fund's WILL ALWAYS REMEMBER photo tribute contest. Officer Lasater served the Pittsburg (CA) Police Department for three years. Tiffany's husband, a sergeant with the Pittsburg Police, served alongside Officer Lasater. Tiffany's photo features Cody, Officer Lasater's 4-year-old son who was born two months after his father was killed. 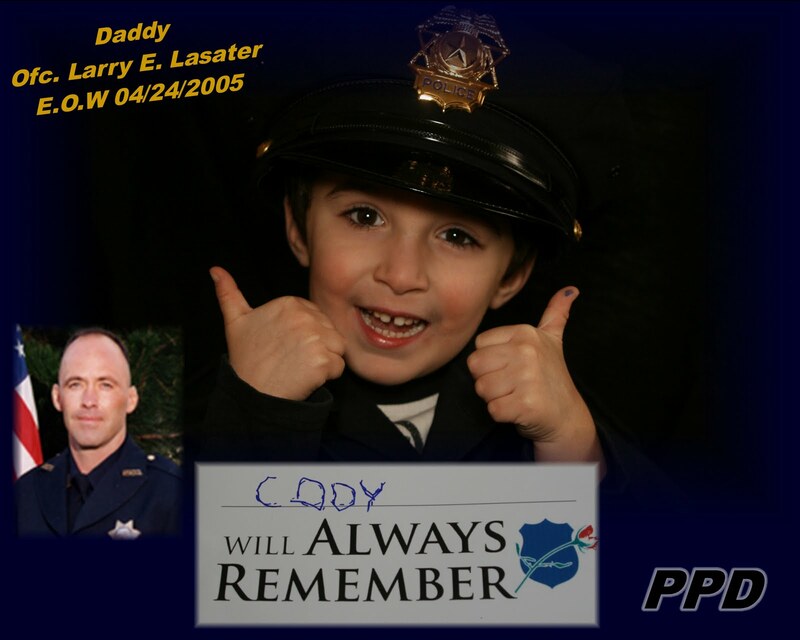 Cody and his mother are planning to attend National Police Week 2010 this May. Thanks again to everyone who participated in the Memorial Fund's WILL ALWAYS REMEMBER photo tribute contest. The participation, creativity, and support for our fallen law enforcement heroes were truly amazing. To view all of the photos submitted to the WILL ALWAYS REMEMBER contest, please visit, http://www.flickr.com/photos/nleomf/sets/72157621461765196/.